This section will give you information on what the Parish Council is responsible for and the services the Council provides and its functions. The Parish Council must spend within budget each year and is subject to internal audit and external audit annually. The allotment site is found on Bempton Lane, Flamborough. Plots are approximately one sixteenth of an acre and currently cost £35 per year to rent. If you would like a plot to cultivate, please contact the Clerk to the Council on 07474681368 or see contact details on this website. Click on the links to the right to view a standard Tenancy Agreement and Conditions of Letting. is owned by the Parish Council and this is a beautiful green area in the centre of the village which is open to all for the purpose of recreational enjoyment. The Parish Council is responsible for cutting the grass and owns and maintains the playground. We have recently provided new equipment for the children to enjoy. Dogs are not permitted within the playground and we ask that this is respected for the health and safety of our children. If you find any faults or have any comments, please contact the Clerk to the Council. is found in the heart of the village at the junction of Tower Street, Carter Lane and Castle Crescent. The Parish Council is responsible for maintaining this area as an attractive garden and there are limits to its use. This is a quiet reflective area with seating and at Christmas is the focal point for Christmas Lighting, Christmas Tree and Nativity Scene. The Parish Council Notice Board and Millenium Mast are also found here. Dogs are not permitted within Camerons Gardens and we ask that this request is respected. The Parish Council cuts the grass here. known as the "Cricket Field" is located at the junction of South Sea Road and Lighthouse Road. This area of land was donated to the Parish Council in 1944 with restrictions to the freehold. The Parish Council must for all time preserve the property as an open space to be used and enjoyed by the public as a playing field, recreation ground or for athletic purposes. The Parish Council may permit an organisation to have the use of the field provided access is given at all times for the public to watch games in progress. Due to this provision, the Parish Council has leased the field to the Flamborough Sports Club Trust since 1966 and they are responsible for its use. For details please see "Clubs" section of this website. is an area of land on the B1255 on the entrance to the village. The Parish Council has looked after this piece of land and worked to maintain it over many decades including landscaping and levelling in the 1980s, restoration work to the pump and has traditionally cut the grass. Following research undertaken by East Riding of Yorkshire Council in 2005, the area was found to be part of the highway. The Parish Council now holds a licence to cultivate the area and maintain the grass in addition to a licence for the parish pump and to repair and maintain it. Click on the link to the right to download the interesting history of the pump. The Parish Council owns 124 street lights (footway lighting) in the village. If you see a problems with a light in the village please contact the Clerk to the Council on 07474681368 or East Riding of Yorkshire Council Lamplighter 24 hour faultline on 01482 395740 or click on the link in the ERYC links page of this website to report a fault online. The public toilets to the rear of the Royal Dog and Duck on Tower Street are owned and maintained by the Parish Council. If you find any fault or have any comments please contact the Clerk to the Council on 07474681368. These conveniences are open daily (except Christmas Day and Boxing Day) from 8.30 am to 5 pm and are cleaned daily by our Cleaner. The Parish Council owns and maintains 46 seats within the Parish at various locations. These seats have been donated to the Parish and cost in the region of £300 which includes a concrete base and brass commemorative plaque. For more details please contact the Clerk to the Council on 07474681368 if you would like to donate a seat. The Parish Council owns four bus shelters (Woodcock Road, North Marine Road at North Landing, Crofts Hill and Tower Street). This is located on Tower Street, Flamborough and stands within the Conservation Area and adjacent to the Scheduled Monument of Flamborough Castle. The War Memorial was included as a Listed Building on 28th April 2006 and is also registered on the National Inventory of War Memorials at the Imperial War Museum, London. Freestanding, it is set on its own and surrounded by a grassed area with shrubs, trees and seating. As it is located at the roadside, it is accessible to the public at all times and is a place for quiet reflection. 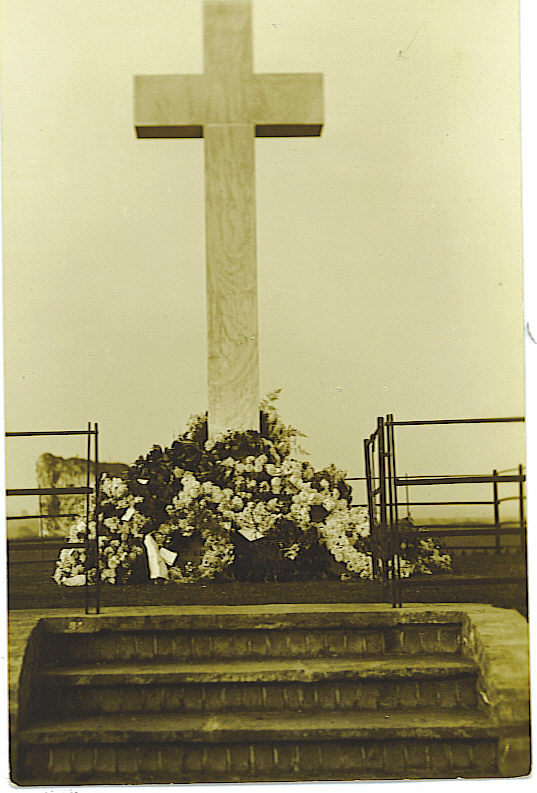 The Memorial is a plain latin cross set on two plinths that commemorate the Great Wars (1914-18 and 1939-45). It is made from portland stone and inlaid with some 41 names from both wars in roman lettering. 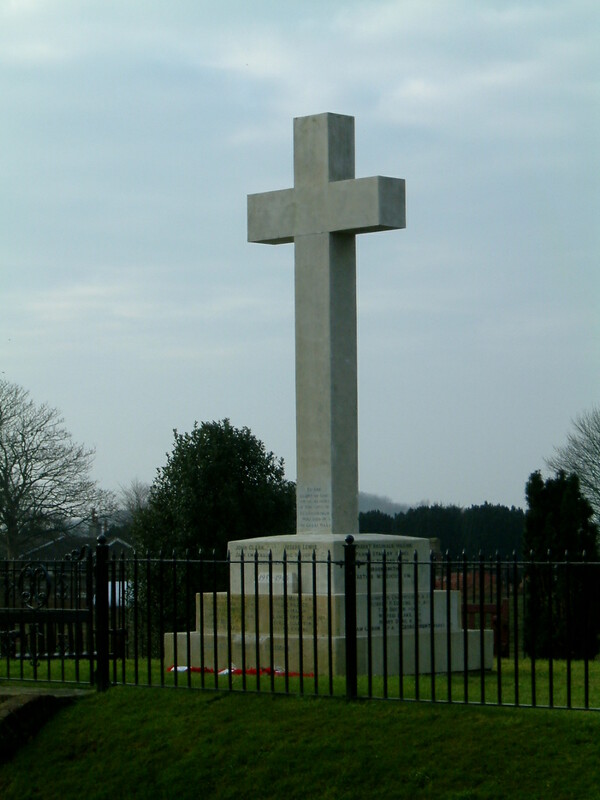 Following a specially convened meeting of the Parish Council on 3rd February 1919 a Committee was set up to consider a public memorial to those who were lost in the war. 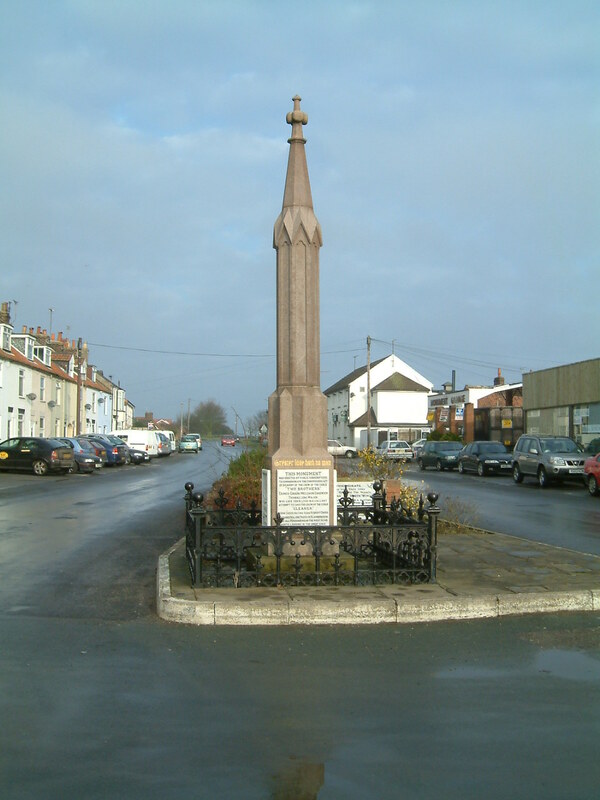 The memorial was paid for by public subscription into a fund and administered by the Committee until 1936 when the responsibility was transferred entirely to the Parish Council. the Parish Council still holds war stock dating back to that time that are to be "held in perpetuity for the upkeep and maintenance of the War Memorial" (extract from Minutes of a meeting winding up the Committee on 24th June 1936). 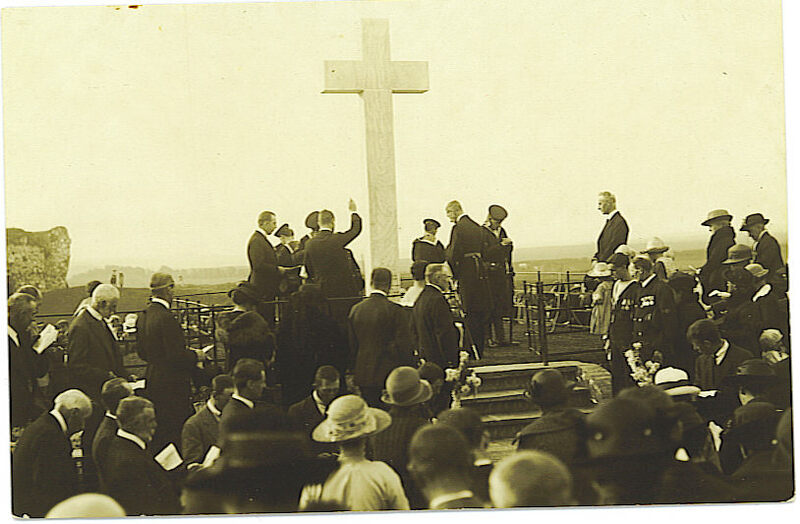 The builder was GW Milburn & Sons, Bootham Bar, York and the Memorial was unveiled on 16th October 1921 by Vice Admiral Sir Morgan Singer and dedicated by Rev D McLean, Vicar of Flamborough. In 1951 the second plinth was added. The Parish Council has maintained the Memorial and surroundings since that time including groundwork, landscaping and new railing in the 1990s by a dedicated group of villages. In 2005 the stone was cleaned at the request of the electors of the Parish to reveal lettering that had been hidden by algae and growth. Refurbishment to the lettering was carried out at the same time. "There was no indication on the morning of the 5th February 1909 the weather would deteriorate so rapidly and with such ferocity. The offshore men who worked off to east'ard had not put to sea as the weather was poor but it was thought to be alright for the inshore men. Some 40 or 50 fishermen had put off to the inshore grounds in their sailing cobles but by 0800 the wind had veered quickly from the south west towards the north and a full storm developed. The force of the gail whipped up the sea into mountainous white topped waves which threatened to engulf the whole fleet. The cobles made a run for the North Landing and all were doing the best they could to get home. One coble, the Gleaner, was passing the West Scar and almost safely into the haven of North Sea Landing, when she was struck by a big sea and knocked completely down. Sea after sea struck the coble and she was overwhelmed, her crew of John Cross and his sons Robert and Richard were thrown into the raging water. The No. 1 station lifeboat, Forester, launched and although double manned, twenty men pulling on the oars instead of the usual ten, she could not get more than fifty yards from the beach. Another Flamborough coble, the Two Brothers, crewed by Melchior Chadwick, Tom Leng Major and George Gibbon had been running for the haven astern of the Gleaner. When it was seen she had been overwhelmed, the Two Brothers ran up alongside the coble. With great difficulty the three men in the water were grabbed by the crew of the Two Brothers, each man clicking hold of one of those in the water and pulling him into the coble. It was feared by those who witnessed the event from the shore that the Two Brothers could not survive, she was in the midst of a boiling, raging sea. In an instance of getting those three fishermen aboard, a sea came up and hit the Two Brothers turning her head into the cliff and then another sea totally swamped her. The six men were struggling in the merciless sea and in a very short time had all disappeared beneath the raging waves. Another Flamborough fisherman, Robert Knaggs, who had been in the coble Felicity that day, and who get ashore safely, stated that the Two Brothers and her crew would have landed safely if they had not gone to the rescue of the crew of the Gleaner. As soon as they saw them in distress, they went to them without any hesitation whatsoever. The funerals of four of the six drowned were held on the 8th February 1909, George Gibbon (34), Tom Leng Major (18), John Cross (44) and Richard Cross (17), the four coffins being carried by local fishermen to the Parish Church of St Oswald. The body of Melchior Chadwick being recovered from the sea near the King and Queen rocks on Tuesday 16th March 1909. All five fishermen were buried in the local cemetery and their graves marked with identical headstones. The body of Robert Cross was never recovered. This day was described as one of the saddest days in the history of the village. A monument was erected in Chapel Street, paid for by public subscription, as a fitting tribute to the heroism and bravery of the crew of the Two Brothers. This was unveiled on 19th August 1909 by the Mayoress of Bridlington, Mrs C G Southcott, who had inaugurated the fund for its erection. Together with the names of the six fishermen who perished that day is the inscription "Greater love hath no man than this that a man lay down his life for his friends". A very fitting tribute indeed. One member of the Flamborough Lifeboat crew that day vowed that he would devote the remainder of his life to the saving of life at sea. His name was Robert Cross, the brother and uncle of the ill fated crew of the coble Gleaner. He became a famous coxswain of the Humber Lifeboat and one of the most outstanding and decorated lifeboat coxswains of the Second World War. During his service with the Royal National Lifeboat Institution at Spurn, he won the George medal and was awarded two Gold Medals, three Silver Medals and two Bronze Medals by the Institution." This memorial is located on Fishermans Gardens next to the Fishermans Memorial at the junction of Tower Street, Carter Lane, Chapel Street and Post Office Street. 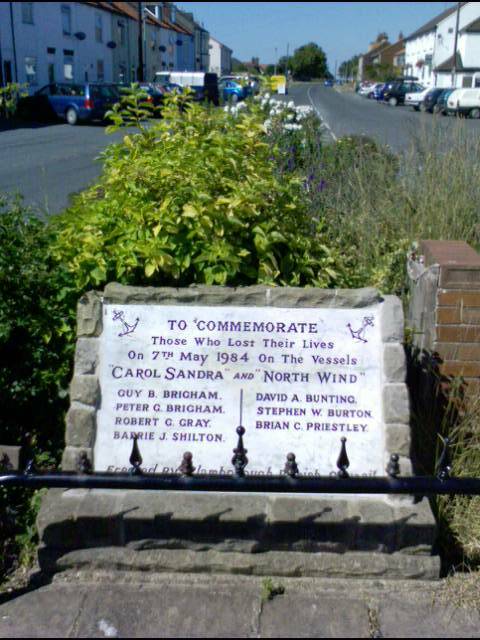 The Memorial was erected by the Parish Council to commemorate those who lost their lives on 7th May 1984 on the vessels "Carol Sandra" and "North Wind". On that day the Carol Sandra and crew left Bridlington harbour to move crab pots and were not seen again. The coble was found upturned in Silex Bay at the Lighthouse and all the crew (Guy Brigham 62, son Peter 29, Robert George Gray 19 and a friend Barrie James Shilton) were missing. Fishing boats joined lifeboats from Flamborough, Bridlington and Filey and a helicopter from RAF Leconfield to search for survivors. This included the fishing boat the North Wind, which had been hired by a party of five from Doncaster to go line fishing for the day from Bridlington. The sea overwhelmed their boat and washed all five overboard. The boat's owner tried to pick up the men but huge waves turned the boat over and the owner and his son (Palmer and David Cockerill) were trapped underneath the boat until they managed to get out and were rescued from the rocks. Two of the five who had been swept from the fishing boat were rescued from the sea. All from the Carol Sandra and anglers Stephen Burton, David Bunting and Charles Priestly perished that day. Flamborough's Coastguard Vic Crosthwaite was honoured for services beyond the call of duty by Britain's chief coastguard, Filey lifeboat man Malcolm Johnson was thanked for his bravery by the RNLI and Flamborough man Steve Emmerson was awarded a bronze medal from the Royal Humane Society. The Parish Council minutes of 3rd December 1984 shows a decision was made to erect a permanent memorial to commemorate those who lost their lives and by 1st April 1985 approval had been given by the bereaved relatives. A 2' 6" square stone was erected by D Mooney, Bridlington, on the fishermans gardens, facing south, by "May Day" of 6th May 1985. Due to public request, this memorial was restored in early 2005 when the marble plaque was taken away and cleaned, the anchors and inscriptions were re-cut and black re-enamelled. The stone was re-fixed and a railing was erected in front of it to try to prevent vandalism. The work was paid for by a donation from relatives and the Parish Council.